The Coen brothers’ breathtaking adaptation of Cormac McCarthy’s novel is one of the finest crime thrillers ever produced. A nerve-wracking and original screenplay with sly wit and tense action sequences is played out brilliantly by a cast which includes Josh Brolin, Javier Bardem, Tommy Lee Jones and Kelly Macdonald. No Country for Old Men manages to surpass the Coens’ earlier smash-hit thriller Fargo (1996). It has won them many international awards, including the 2008 Oscars for Best Picture and Best Director. 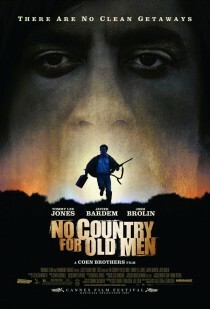 An ultra-cool film, No Country for Old Men stands firmly in Wonderful Cinema’s list of All-Time Top 10 Favourite Films. Oh my! i just had the opportunity to see this movie last night. I was grounded to my seat from beginning to end.Very interesting! This was Javier Bardem’s movie. He should have won the Oscar for Best Actor, not Best Supporting. Not a happy film, but one that says something and makes you think. That I did not know. Thanks, Kevin!